For today’s post I’m showing an outfit that I am basically copying (I like to say inspired) by something I saw somewhere… I honestly can’t remember where- I should have written it down. I love the effortless glamour of this gal on the right. She just exudes ‘cool’. I thought, ‘well, I can do that’! I paired my Paige jeans with a plain white button down- tucked in- and added a belt. I am wearing my snakeskin heels and then to add that element of cool, I’ve got on my trench coat. Unlike the gal on the right, I am actually wearing my coat- I love how she has it draped over her shoulders- but that’s just not practical! I bet she didn't get her trench at Target! I love how the snakeskin shoes add some style as well! Classic outfit… I’ll call it inspiration! Looks great. 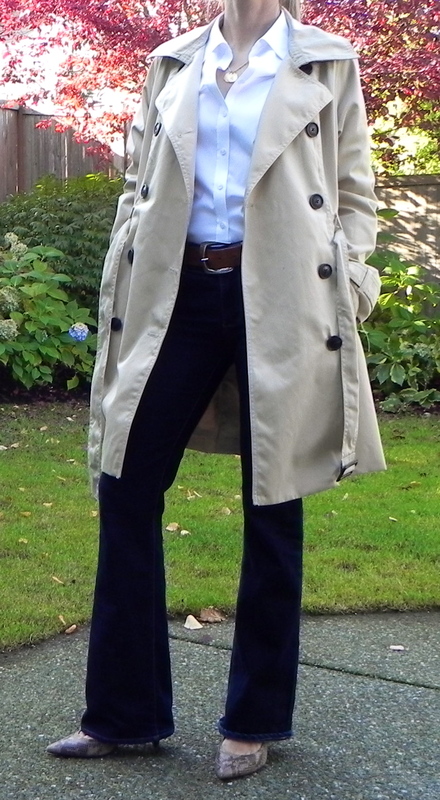 love the trench coat – i’ve been wanting one for awhile.